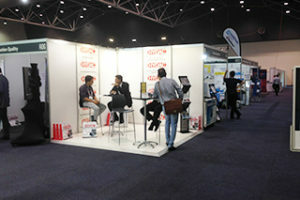 Home / News / Press / HYDAC exhibited at AOG 2017 – Australasian Oil & Gas Exhibition and Conference! 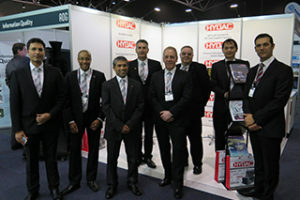 HYDAC exhibited at AOG 2017 – Australasian Oil & Gas Exhibition and Conference! Once again we had an opportunity to meet you face-to-face and take you through our capabilities, such as the ISO 29001 certification. The ISO/ TS 29001 standard is an extension of the internationally recognised ISO 9001 quality management systems standard. It has been developed as a direct result of a partnership between ISO and the international oil and gas industry. The ISO/TS 29001 defines the quality management system for product and service supply organisations for the petroleum, petrochemical and natural gas industries. This certification by SAI Global verifies that we are committed to the quality and it ensures standardisation and improvement within the Oil & Gas sector. 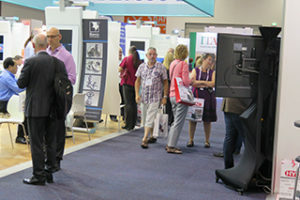 So, if your supplier doesn’t have ISO 29001 certification, you are at risk! 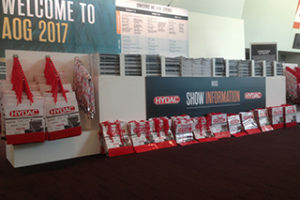 This year, HYDAC was a major sponsor of the event; we sponsored the show bags and lanyards.